 Revitalize Dry Winter Skin with Mirakle Cream, a Celeb Favorite for Getting Red Carpet Ready! The frigid cold winter weather can really take its toll on your skin, leaving it dried out and lifeless. Whether it is being chapped by the merciless wind or reddened by the bitter frost, your skin needs a miracle product to protect it in these cooler months. Mirakle Cream, made by The Better Skin Company, is the perfect solution to revitalize, nourish and protect your skin. I am aleady a huge fan of The Better Skin Co.'s Mirakle Cream because of the way it transforms my skin, so I thought it was interesting to show Orange is the New Black Star Jessica Pimentel using her Mirakle Cream as she gets red carpet ready. I was just excited to share this as well as the fact that RIGHT NOW with any Mirakle Cream purchase, you will receive the new Epik C for only $21 (a 50% savings). 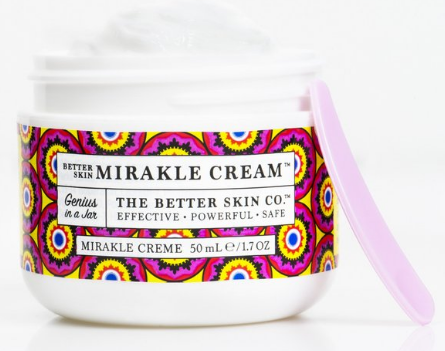 *when you place the Mirakle Cream in your cart a pop up with the offer will occur. Offer ends 01/29/18. Shop now! Number 4™ Jour d'automne™ Sugar Texturizing Spray denounces salt while heralding sugar in a declaration of sweet love for hair texture that is perfectly undone. Transform limp, lackluster strands into loose, touchably soft, "beach inspired" waves with a nourishing blend of sugar and flexible styling aids. Sugar Texturizing Spray aids in style defense against humidity to help build a long-lasting relationship with texture that's more than just a summer fling. HOW IT WORKS : Number 4 Sugar Texturizing Spray achieves hair texture through simple sugar cane molecules and flexible styling aids producing a lattice of soft structure and haphazard patterns of loose, shiny waves. HOW TO USE: Spray through mid-lengths to ends. Scrunch, tousle, blow dry with a diffuser, or air dry as desired. RESULTS: Hair in need of a texture reboot will thrive with a sweet misting of Sugar Texturizing Spray. Create a transformative element of style with staying power-the undone, "beachy" wave. Flex net resins help keep glossy texture intact despite unfavorable conditions of heat and humidity, while anti-static properties provide extra nourishment. PROPERTIES: Color Protecting, Anti-Aging, Vegan, Cruelty Free, Gluten Free, Sulfate, Sodium Chloride, and Paraben Free. Fragrance Notes: Tonka Beans, Patchouli, Spanish Moss. MY THOUGHTS: I love having beachy waves in my hair. I once wore my hair straight and sleek, but my hair became heavily damaged due to the heat styling I was subjecting it to every day. So, I decided to start wearing my hair naturally. I started using texturizing sprays that contained salt, and they did give me my desired waves, but tended to dry out my locks. 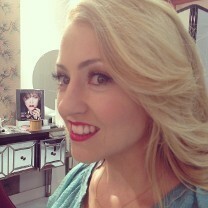 I was given the chance to try out the Sugar Texturizing Spray from Number 4. I usually use the spray on my hair when it is dry, first thing in the morning. I spray my hair liberally with it, and then I scrunch it all over until I have the beachy look I am after. I absolutely love how beautiful and soft my hair looks and feels. The fragrance is beyond heavenly as well. The waves in my hair look natural and luxurious. About Number 4: Innovative, Lightweight, Color Protecting, Anti-Aging Formulas. 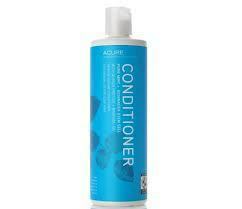 100% Vegan, Gluten Free, Sulfate & Sodium Chloride Free, Paraben Free. The Ultimate Hair Care Experience. California based Number 4 High Performance Hair Care was founded to define new stylistic territories in newfound creative and artistic capacities. Our collection represents a strategic alliance of styling, hydrating, volumizing and essential products to deliver a unique voice in the hair care and beauty industry. 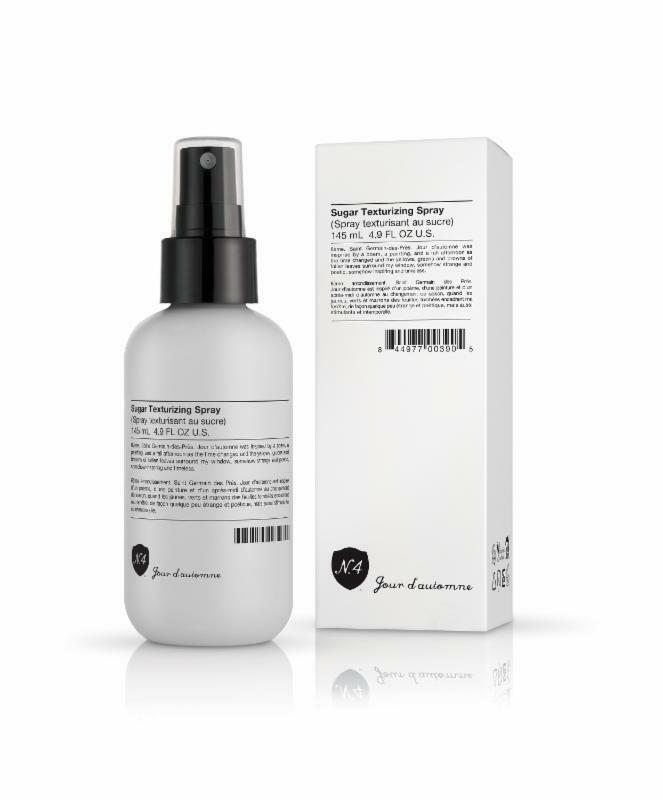 Number 4 Sugar Texturizing Spray 4.9OZ is available in salons and select retailers nationwide. Suggested Retail Price is $22.00. For a complete listing, please visit www.number4hair.com. This time of the year, my skin becomes really sensitive from the dropping temperatures. It becomes rough and dry, and nothing seems to remedy the problem. I received a sample of Mirakle Cream to review. From my very first application, I could feel a difference in the way my skin felt. It was instantly hydrated and soothed. I love how lightweight Mirakle Cream is, and how it absorbs perfectly into my skin, leaving it feeling supple and looking radiant. 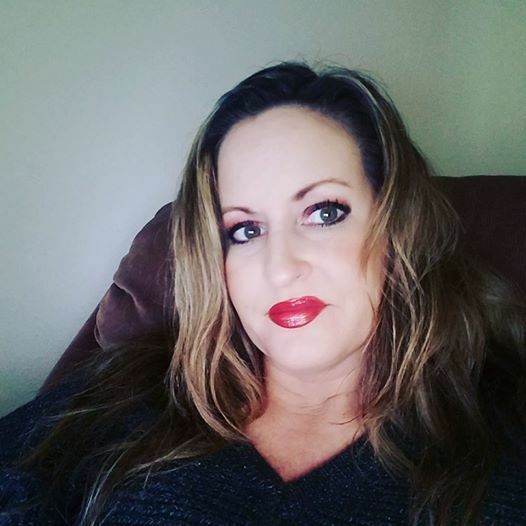 It helps to smooth out fine lines and wrinkles, and is also the perfect base for my foundation. 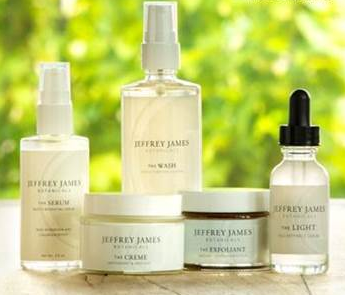  Introducing Jeffrey James Botanicals~My newest Favorite Skin Care Line! 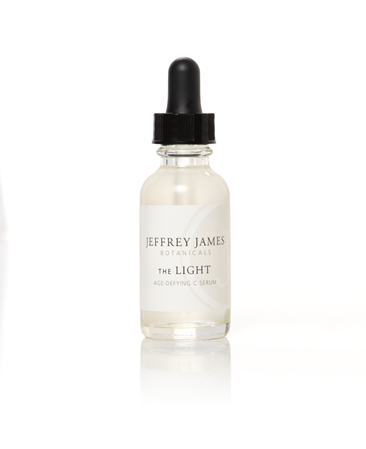 Dedicated to creating the most effective, organic product on the market, Jeffrey James fashioned a sophisticated, natural skincare line that adapts to every skin type and concern. 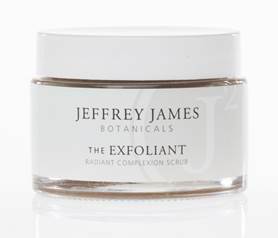 Jeffrey James Botanicals combines modern skincare with science and natural actives to create a truly luxurious, organic experience. 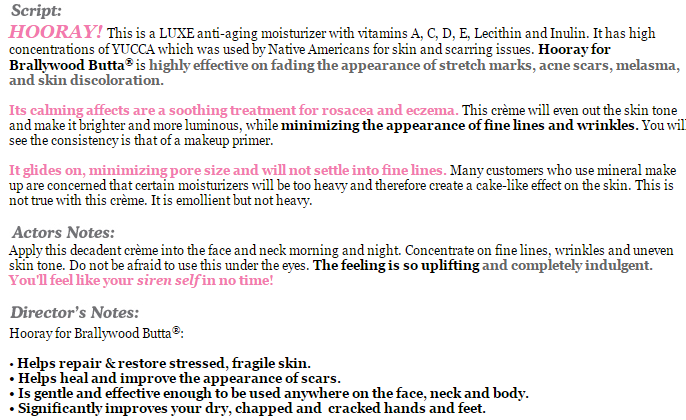 Below are the descriptions of the products. A rich blend of organic essential oils and ocean minerals create a therapeutic facial cleanser to nourish and repair dry, blemish-prone and rough, damaged skin. Vitamin E and Rose Hip Oil diminish discoloration and repair scarring. 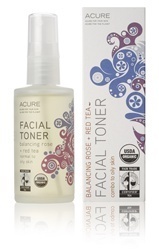 Botanicals soothe and renew skin cells and stimulate cellular regeneration. Bamboo heals and energizes skin, while Aloe Vera, essential oils and raspberry extract draw out toxins. High in antioxidants and bio-flavonoids, this scrub nourishes and protects skin while gently exfoliating for accelerated cell regeneration. Rejuvenate skin with Glycolic and Alpha Hydroxyl Acids that boost cell renewal and collagen production. Bee propolis and royal jelly restore proteins and enzymes to reveal healthier, more supple skin. Hyaluronic Acid makes up 50% of this formulation to draw moisture from the environment to skin. This serum penetrates deeply to activate collagen production for a fresh, youthful complexion. Intensive antioxidant repair serum defies aging by restoring skin’s elasticity. Argan stem cells accelerate skin’s natural repair process to rejuvenate tired complexions. Vitamin C brightens and boosts collagen production while hyaluronic acid deeply nourishes to reduce the appearance of lines and wrinkles. 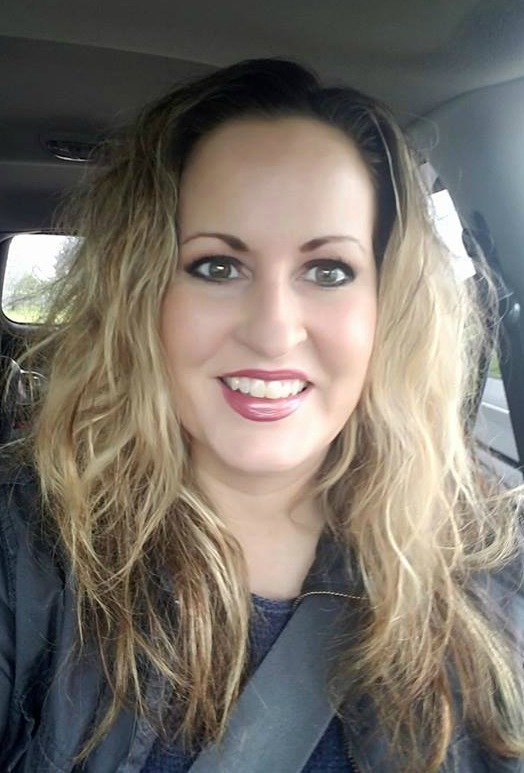 Amy Rueda created Authentic Skin Remedies after successfully battling a rare form of neuroendocrine system cancer, believed to have been hormonally based with strong environmental links. Amy wanted her product line to center around three factors. First, they had to contain 100% certified organic ingredients, 100% essential oils, and be chemical free. 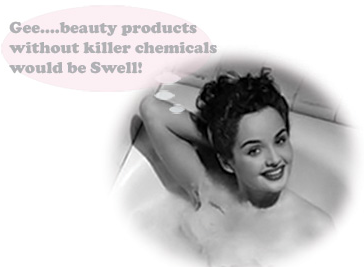 Second, the products needed to actually work better than many of the popular anti-aging and solution skin care products currently containing harmful chemicals. Many of her products focus on treating common skin issues such as acne, rosacea and eczema using ingredients found in nature. Lastly, the products had to be easy for today's fast-paced, savvy consumers to use on a daily basis. The Bath and Body Luxe line is a three step regimen to polish, gloss, quench and nourish skin from head to toe. 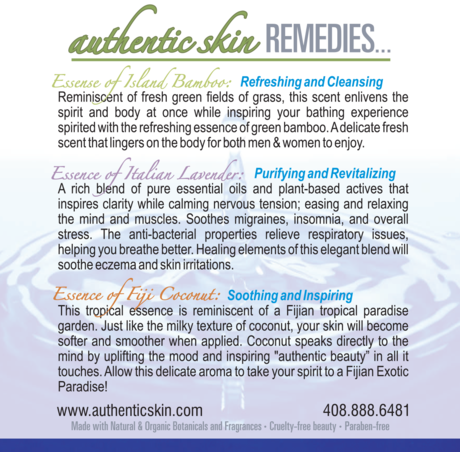 All products are plant and fruit based with 100 percent certified organic ingredients and pure essential oils. The perfect natural buffing formula for dry, lackluster skin. A blend of organic brown sugar crystals infused with essential Avocado Oil which helps improve circulation and acts a total body cleanser. Slough away dryness while eliminating skin impurities, for glowing skin with a delicate fragrance. After one use, skin appears to be firmer and more radiant. 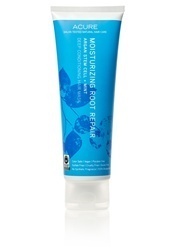 My Experience: I used this wonderful scrub on my elbows and heels during my shower. It left my skin soft and feeling luxurious. A subtle aromatic, multi-use emollient. 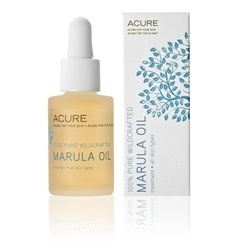 This softening oil contains avocado oil and sunflower seed oil which best mimics skins natural oils. It can be layered with a daily application of QUENCH for an added boost of nourishing hydration. Use from head-to-toe to tame frizzy flyaway hair, soften nail cuticles and dry heels. Excellent as a pre-shave prep oil and to soften rough beards. Massage onto body. 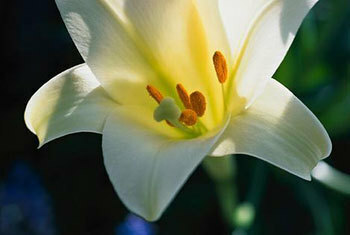 Leaves a delicate essence in place of harsh perfumes. My Experience: I used Gloss all over my body for a delightful moisturizer. It smells wonderful! My skin really felt soft and supple afterwards. 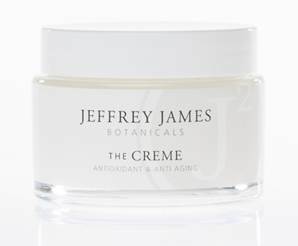 A luxurious botanical balm will nourish the most parched skin without leaving a sticky film. Leaves your skin smooth, supple and delicately fragranced with a coconut essence. The natural, plant-based ingredients such as Sunflower Seed oil and Shea Butter soften and enrich dry, dehydrated skin, while the essence appeals to your other senses. My Experience: I love a good body balm and this one is amazing! I use it on my elbows, hands and feet. My dry skin is left renewed and it smells yummy, like coconut!